Raima Database Manager is one of the very few embedded database systems that supports the INCITS/ISO/IEC 9075-2:2011  SQL standard. The feature-rich SQL component allows for very rapid and simple deployment of an SQL database system using RDM, while also allowing flexibility to later concurrently use the more optimized core cursor API with the same system. RDM’s SQL PL feature allows for a SQL developer to create more advanced logic within their SQL database system without having to learn a more complicated programming language like C/C++/C#/Java. The SQL Procedural Language feature of the RDM database system allows for a SQL database developer to access full programming constructs purely in SQL. They can create conditional statements, for and while loops, declare and use variables, all while using only SQL. There is even error handling support for custom error situations. Additionally, these statements are compiled and executed on the server side, greatly improving the performance of the overall system. SQL triggers are a form of SQL PL that lets the SQL developer create custom events to occur when certain conditions are met in a normal create/insert/update/delete SQL statement. They can be simple things like returning an error if an insert is out of the bounds of a column, or more complicated things, like updating a further table/row if certain conditions are satisfied. 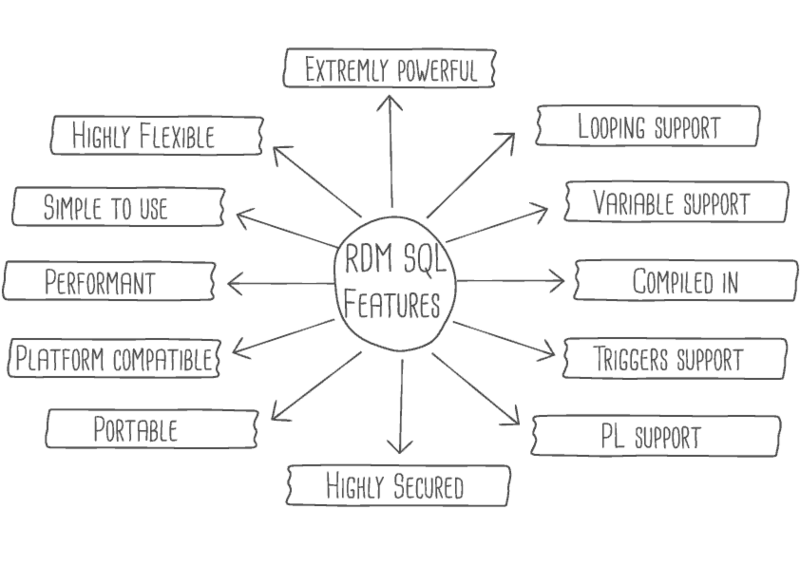 RDM supports multiple different programming languages that interact with the SQL engine. For C#, Raima supports the ADO.NET interface. For Java, Raima supports JDBC. For C/C++, Raima has full ODBC support. RDM is designed so that whatever language the programmer is comfortable with, they can stay within that environment/IDE. Rowid (i.e., database address) primary and foreign keys which will allow direct access to individual rows of a table without having to incur the overhead of an index. As an embedded database, RDM’s enhanced SQL support permits developers to work as they prefer, and helps businesses meet big data needs related to cloud and fog computing.